Shirley Wright, an Auxiliary member from the Nashville South Camp hands out Medical Testaments at the AAOHN national conference. © 2012 The Gideons International. 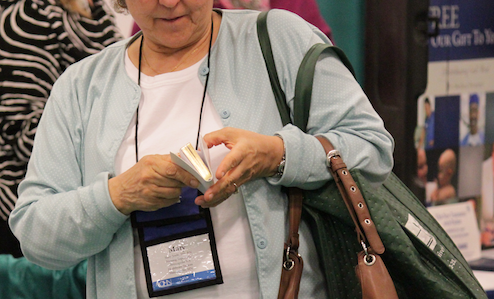 NASHVILLE – The Auxiliary of The Gideons International (wives of Gideons who serve in the association) distributed Medical Testaments at the national conference of the American Association of Occupational Health Nurses (AAOHN), Tuesday April 24th at the Gaylord Opryland Resort and Convention Center. Shirley Wright, an Auxiliary member who participated in the distribution, said that by Tuesday afternoon the team of Auxiliary distributed approximately 200 Medical Testaments. Many attendees expressed their sincere appreciation for their very own copy of God’s Word. In the past year, over 200 national and state medical conventions were attended by Auxiliary members around the USA. 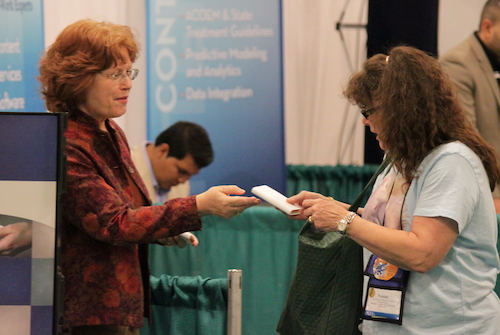 This was Shirley’s ninth distribution at a medical convention in the past year. As an Auxiliary member now for 30 years, Shirley says she has grown spiritually serving beside her husband who has been a Gideon for 30 years as well. A new owner of a Medical Testament from the Auxiliary. © 2012 The Gideons International. “The nurses and medical personnel give us encouraging words about how they use the Testaments,” says Shirley. Earlier in the day, one nurse shared an amusing anecdote. Not only had her Medical Testament come in handy for witnessing to others, but that recently she even used it as a makeshift splint in an emergency situation. Shirley explained that it’s important to share God’s Word with medical workers as they are in contact with people who are open to what God has to say. “They come into contact with people who are hurting and searching for answers to their problems. And they’re afraid, too. Medical personnel can use the Word to comfort and encourage patients,” says Shirley. She added that the New Testaments give medical workers a chance to witness to a lost individual at what may be the one time in a person’s life that they are open to hearing the Gospel. “It’s an important avenue for us as Auxiliary and I’m happy that we serve the Lord in this way,” says Shirley.